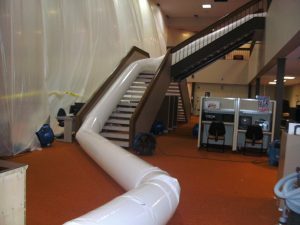 It’s essential to contain water damage to building structure by sealing off the afflicted area as quickly as possible to avoid outside air or other sources adding humidity to the locale. This way you only have to deal with the water that is already in the locale. It’s equally important to remove the moisture or humidity as quickly as possible. In most cases, it’s beneficial to add heat to the room to increase the evaporation. 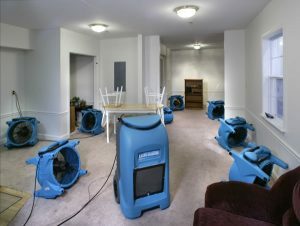 This is especially true if the water damage occurred recently and the water has not had time to penetrate deep into furniture and movables, or walls, floors, and other parts of the building structure. 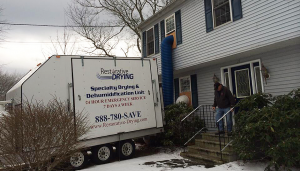 If the water has had time to penetrate deep into the building structure you need to use a larger dehumidification capacity to get quick results. Empirical values are essential to ascertain the required dehumidification load. Refrigerant and low grain refrigerants (LGR) are the standard dehumidification units used in water damaged homes and/or basements to lower humidity levels. Refrigerants are the most effective dehumidifiers in warm and humid conditions. Single Source has a large variety of desiccant dehumidifiers fit for every job. Desiccants perform where other units in the industry cannot properly operate, such as in cold temperatures. Desiccants generally work to their maximum in large open areas and have capabilities of drying out structural materials such as wood, concrete, plaster, etc. much faster than traditional refrigerant dehumidifiers. This can reduce drying costs and rebuild costs significantly. Examples of ideal locations for the use of these dehumidifiers are schools, multi-story homes or buildings and large commercial buildings. Single Source can accommodate residential, commercial and industrial buildings with a fleet of Desiccants ranging from 2000 – 15,000 cubic feet per minutes (cfm).